Play kikashi against strong groups! Resist kikashi against strong groups! (moved from main page) Neither Black or White should consider this part of the board as important, at least in the beginning phase of the game. Why is that so? For White, the side is uninteresting because the marked stone is low and no really big potential territory can be developed. 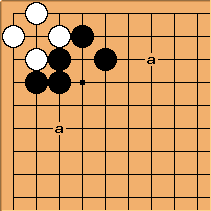 For Black, a move around a would be a natural development from the hoshi stone , but White could easily invade at e and live without fearing any consequences for her strong group. dnerra: I don't think White should be considered thick here. The point is rather that White is low and solid. Hence the upper side is not so interesting, and usually c will be larger than e. Note that Black d is often a good move, since it allows a few interesting follow-ups. This could not be the case if White were rightfully considered thick. Actually, the proverb should state: don't try to build a position too close to your opponent's thickness. The proverb also applies to your own thickness. If you build two strong groups in the same area of the board, you somehow duplicate your efforts, which is not efficient. Jasonred Doesn't one group make the other stronger, with the chance to connect and mutual killing of enemy invasions? Charles Matthews There is no remedy for Overconcentrated shape. It is normally better to be spread too thinly, because you can fix that later. Velobici: Seems like we need some text explaining how this maxim and the maxim Make both ends strong are compatible. Something that might talk about the two ends of Make both ends strong not being groups and the ends can can be expected to join into one group or severely attack an attempt to prevent them from joining. Could a dan level player add this explanation? Later: On second thought, I wouldn't call White's corner thin. ;-) So I guess it is thick, but I would not call it thickness. Spindizzy1976 I think this is one of the most important proverbs for lower level players (like myself). However, I'm afraid this page isn't as helpful as it could be. There is a lot about technicalities and exceptions to the rule, and very little about the rule itself. If some high level players could rearrange the text to start with a few basic paradigms, it would be much appreciated. Dieter: I really think we should try getting around the subtleties of thickness/atsumi by using the terms strong/alive/territory/influence. I'll give a few examples, apply the proverb to it and hopefully show that you can understand this proverb without having to finish the debate first on what thickness is. The white group is alive and makes two points of territory. The black group is strong (is connected and has eyeshape) and has influence to sides and centre. Now for White to approach the strong group at any of the points a, would be a mistake. The stone is immediately weak, due to Black's strength. The white group is again alive with 4+ points of territory. The black group has a lot of influence towards the left side and centre. However, it is not as strong as the black group in the previous example: there is a cutting point (currently depending on a ladder) and there is no clear eyeshape. For White now to play a, even if it is in Black's influence, is not bad in general, and depends on the surrounding positions, because a is not necessarily "close to strength". Likewise, Black a would provide eyespace and additional strength. For White to play b would be expand from her own territory (playing extremely close to her own strength) and must be left for the endgame, where normally all groups are strong and no open area remains. The third example is the diagram with which this page starts. 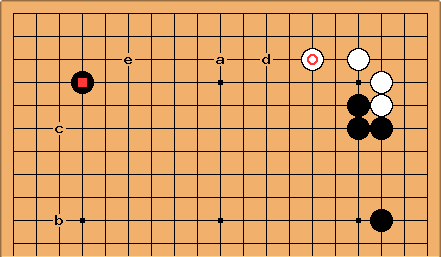 White's group is strong: it is connected through basic moves and has enough scope for eyespace in the corner, which can even be called territory. Black's group consists of a strong connection plus an ideal extension, providing virtual connectivity and eyespace. 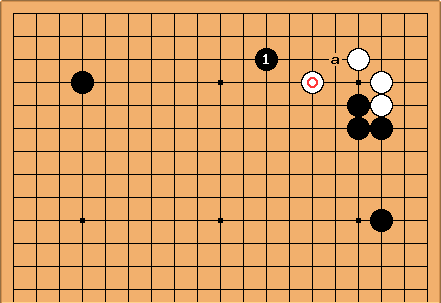 Given the invasion point at a, there is definitely more lingering weakness in Black's position. 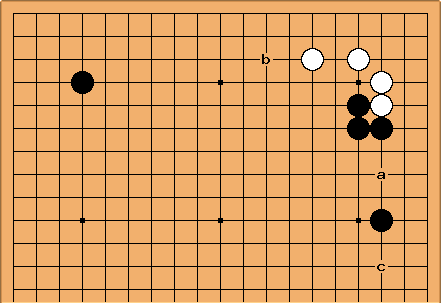 White's group has influence towards the top, Black towards right side and centre. For Black to approach at b, would be a mistake: there is hardly any impact on White's strong group. Likewise, White expanding at b would be slow. For White to approach at c, prepares the invasion at a. This is not in general a mistake and depends on the rest of the board. Compare the previous with this diagram: now the White stone is high, providing more scope for development (influence) but less stability (strength). 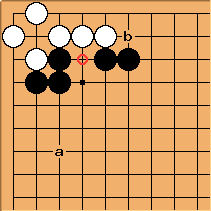 Black now does have impact on the White group, because it threatens to cut through the keima at a. White's weakness there can now be exploited - without it couldn't. This subtle difference in placement of the extension stone, makes a big difference for strategic decision, such as approaching strength. 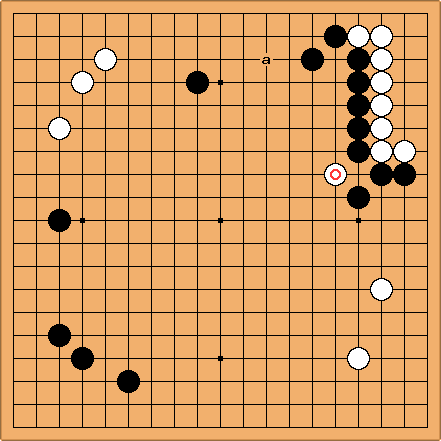 White might think that a move around b is terrible and she's probably right: there are other moves. But it is also against the saying "play away from thickness" for Black to move at b or c himself. For the same reason, a move around a is also bad for White in this situation. An approach move around d or e is better than a for White because "stay away from thickness" means stay away from your own thickness as well. Floris: I don't think a white move at 'b' is bad. Looking at the board position, in my opinion a move at 'b' is the only move for w. Why do you think 'b' is so bad? Bill: I wouldn't call b bad, but compare the prospects of Wb vs. Wd. Also consider the prospects for Bf or Bg vs. Bb or thereabouts. Floris: I have considered 'Wd' but my opinion is that white will be faced with: A) A boring game B) Running after the fact that he is behind the entire game, resulting in a loss for him. I believe that black is in a much better position and that white shouldn't sit still and let it keep getting bigger. Bill: Black's advantage should not obscure the point of this page. Therefore, I have altered the diagram so that Black's advantage is only one move, the 4-4 point in the bottom right corner. Now that White does not have to play catch-up, it should be clear that Wb is inferior to other kakaris. Charles's suggestion of a wedge on the bottom side (below) is a good one. Extending from a very thick and obviously 100% alive group is merely point-grabbing. Remember the saying play urgent moves before big moves... Well, extending from a 100% alive/thick group is not urgent. It's just big. So play an urgent move first! And if there are no urgent moves, move into a big space like around d or e.
Charles Matthews The wedge play seems to be an obvious candidate here: if Black is allowed to play at a to form sanrensei that gives him a plan on a larger scale than White can match. The other move I'd consider at first glance is White at b: but if Black plays a pincer the game will proceed at a higher speed, and Black's thick wall above will probably show to greater advantage. Charles This whole page seems quite questionable. At least, there seems not to be any 'standard' example here. In this artificially created position, the marked white stone obviously goes against the proverb not to play in the neighborhood of thickness. White plays just next to a thick black position! Is it a bad move for this reason? No, there is nothing wrong with it because this move is a kikashi which can be discarded after Black connects. White is not trying to establish herself in the area, she just wants to play a move which might help her in the future, without losing anything. On the contrary, an invasion at a for instance, would go against the rule and would be very bad (there is absolutely no prospect of making a base for White in this area). Charles Matthews That seems to assume Black will just connect in reply to the peep. Black should certainly play here first. If White plays that's heavy, so that Black could play with some satisfaction. at b is a better idea but then there is no threat to cut, so the peep is a failure. The idea here is that Black is so strong he shouldn't be forced and pushed around like this.